Childish Gambino performs onstage during the 2018 iHeartRadio Music Festival on Sept. 21, 2018, in Las Vegas. Rap had some big moments at the 61st Annual Grammy Awards, which is a huge feat given the ceremony’s history with the genre. I’m still on a high after witnessing the highly lovable Cardi B accept a history-making award, making her the first solo woman artist to win Best Rap Album. It only took 30 Grammy ceremonies since the launch of the category. Still, it wasn’t just Belcalis who had a huge night. Another rapper with moniker duality made history, as well. 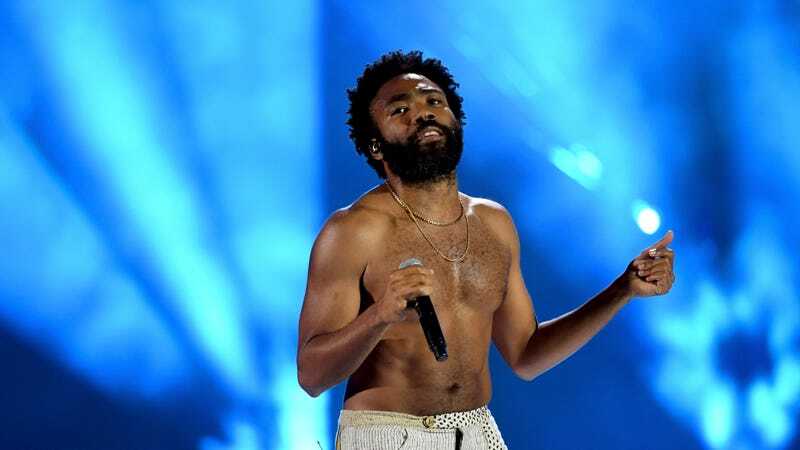 Donald Glover, better known onstage as Childish Gambino, became the first rapper to win Record of the Year. Again, I say—30 Grammy ceremonies. This is...Black History Month. Unfortunately, the rapper-actor wasn’t at the ceremony to accept the award in person. Hey, we told you he was busy. In the press room, Göransson told us how he’d fully processed the gravity of the moment after winning Song of the Year shortly before—another award rap had never claimed until that night. He noted how he really had to sit with the fact that a rap song scored both huge awards on the same night. Both. And a rap song with such a visceral message about the current state of affairs in our country—and, to a larger extent, our society. That...is the beauty of art. Simply put, Record of the Year deals with a specific recording of a song and recognizes the artists, producers and engineers who contribute to that recording, while Song of the Year deals with the composition of a song and recognizes the songwriters who wrote the song. Let that marinate. Members of the Recording Academy thought “This Is America” was so dope, they decided to award each and every person responsible for the very skeleton of the song. Add the Grammys’ shaky history with rap as a category, and you’ve got yourself a hugely significant moment. As Inverse notes, the first hip-hop category (Best Rap Performance) was established in 1989, which was 10 whole years after the Sugarhill Gang released the iconic “Rapper’s Delight.” Additionally, DJ Jazzy Jeff and the Fresh Prince refused to accept said award because the Recording Academy chose not to air the winning announcement during the main show’s telecast. Cut to this Year of our Based God 2019, and that very category still aired during the preview show. Kendrick Lamar, Jay Rock, Future, and James Blake’s Black Panther collaboration tied with Anderson .Paak for this year’s Rap Performance win, by the way. This historical context makes Childish Gambino’s win that much more acute. “To finally be able to celebrate your lifelong work with such an incredible honest person is incredibly special, especially for this song,” Göransson said backstage, per the Hollywood Reporter. He had been working with Childish Gambino for 10 years. Donald Glover Sr. would be proud. For the complete list of winners at the 61st Annual Grammy Awards, head to the Recording Academy’s official Grammys website.